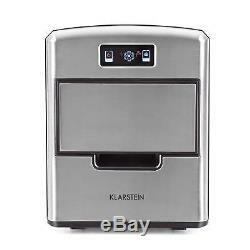 Klarstein Metropolitan Ice Cube Machine 12 kg/24h Digital Display. Easy to operate : easy operation via digital display. 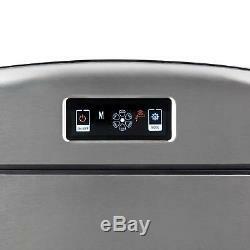 Variable and Powerful : 3 cube sizes selectable, up to 12 kg of finished ice cubes in 24 hours. Cooler look : stylish housing in minimalist dimensions: fits into any party room. Variable : 3 cube sizes selectable. 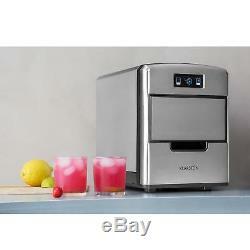 Powerful : up to 12 kg of finished ice cubes in 24 hours. Practical : carrying handles for easy transport. Everything in view : displays water and ice level. 2.15 litre water tank. 700 gram ice cube container. Circulation system: melting ice cubes are reshaped. Warning lights for missing water or full ice cube trays. Dimensions: 26 x 33 x 33 cm (WxHxD). 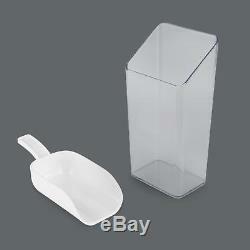 1 x ice cube container. User manual in English (other languages: German). Limitless ice cube supply for the bar on the roof terrace, up to 12 kg of ice cubes in 24 hours. 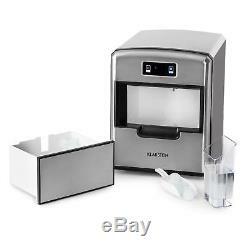 Three selectable ice cube sizes and easy operation via a digital LCD display. 2 carrying handles allow fast transport, e. From the kitchen to the party room. The Klarstein Metropolitan ice cube maker conjures up cool drinks for hot parties or a cool thirst quencher for the in-between times! Whether for a cocktail with the same name, a long drink or a little thirst quencher, only with the right temperature will drinks be perfect. The elegant look of the ice cube maker is complemented by an illuminated, digital display. 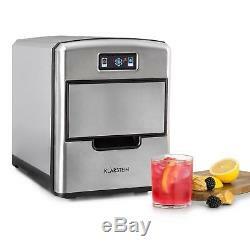 With the Klarstein Metropolitan ice cube machine , drinks always get the needed ice cubes. And thanks to the carrying handles on the side of it, the Klarstein Metropolitan is a professional communter, going between the kitchen and the party location. In this way, ice cold drinks can be enjoyed beyond your own four walls. Within 24 hours, the Klarstein Metropolitan ice cube machine prepares up to 12 kg of ice cubes and provides plenty of supplies for cold refreshments, even for long party nights. Up to 36 ice cubes are produced per hour. 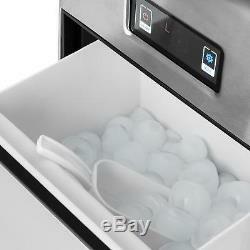 For 9 ice cubes, the device only takes about 15 minutes. Simply fill the 2.15-litre tank with water, select the desired ice cube size from the 3 available and off you go. For easy distribution, the container wth the ice can be removed, and it also comes with a handy ice scoop. Operation is easy via a digital display, which indicates when the water tank is empty or when the ice cube container is full. The Klarstein Metropolitan ice cube maker is particularly narrow and very small, so it has no trouble finding its place in narrow bars and in the smallest party cellar. Head towards the ice cubes! 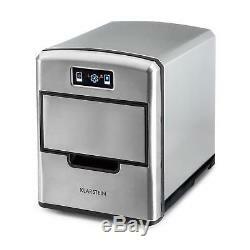 The Klarstein Metropolitan ice cube maker is the express way to ice-cold refreshing drinks. 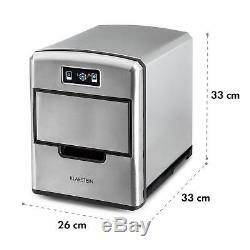 The item "Ice cube Maker Machine Kitchen Appliance 12kg /24h 3 Sizes Commercial Bar Drinks" is in sale since Friday, July 6, 2018.